Do you subitize? Subitizing is the ability to instantly recognize a pattern such as dots on a die. Students who have poor visual discrimination skills typically struggle with this skill. I’m always looking for new ways to teach the same old thing and this whole group idea for using a gumball machine fits the bill. 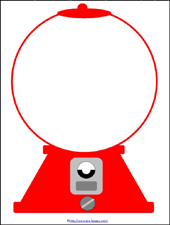 First, print the image of the gumball machine below on sticker paper. Then, cut out the image and attach it to a magnetic cookie sheet. Next, laminate some construction paper in the colors of your choice and use your circle punch or scissors to cut out “gumballs.” Attach a piece of magnetic tape to the back of each gumball. You can play this game with your whole group; it’s great for when you have a few minutes here or there. Turn the cookie tray towards yourself and place a few of the magnetic gumballs inside the outline of the gumball machine. I usually have the children cover their eyes during this time; they get a big kick out of this part. Next, quickly turn the tray to face the students. The students have to look at the tray and hold up the number of fingers to match the number of gumballs on the tray. You will be able to immediately identify who needs more practice with this skill. We usually play subitizing games for about 3-4 minutes a few times a week. You can find more information about and ideas for developing subitizing skills here. 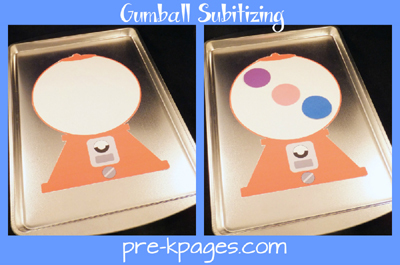 How do you practice subitizing skills in your classroom? Follow my Math board on Pinterest for more great ideas! Follow Vanessa @pre-kpages.com’s board Teaching Math on Pinterest. we practice subitizing by rolling a die. The size of the pattern is nice and should help in the visual skills for the children who need it. Can think of a few ‘other’ ways to use it too. Thanks for sharing. We practice this daily during opening time. I have several large square cards that have dots to resemble dice. I choose a card and the helper has to quickly ‘read’ the correct number, then write the numeral on a small magnetic wipe off board that stays on our large opening board. Later in the year, I show first one card and then a different one to practice ‘counting on’. The kids love this and beg for ‘big’ numbers!